Flo-Rite Plumbing is a specialised plumbing company in the field of backflow testing, backflow prevention, backflow valve testing, backflow certification, backflow repairs and backflow valve maintenance. We test, certify and repair backflow valves and devices through our Brisbane and Gold Coast offices. It is our aim to provide good reliable service at the most competitive price. Our 30 years of experience in the business of backflow installation and backflow testing of backflow prevention devices or backflow valves allow Flo-Rite Plumbing to keep both backflow valve testing and backflow repair costs to a minimum. We also send our clients reminders of the upcoming date of their annual inspection and backflow testing requirements from there local authority. elements of safe drinking water systems in our communities and workplaces. connections to the local authorities water supply system. 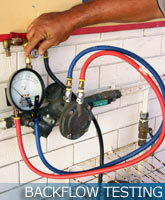 Only licensed plumbers can test and install a backflow prevention valve or containment device. training organisation can, test and commission backflow valves. Should you require further information, please email Flo-Rite Plumbings Backflow team. After testing your device Flo-Rite Plumbing will give you a yellow copy of the Backflow Prevention Device Inspection and Maintenance Report. The original will be sent to your local authority within 2 days of testing to ensure customer compliance with government backflow prevention requirements. The water supply system is designed to ensure that water flows to your property under pressure. If this pressure is not maintained, there is a chance that water could be drawn backwards into the water main. • the water outlet at the property is higher than the water main, causing constant back pressure. There is a risk to public health if there is a cross connection between your water supply and a contaminated source. If there is a pressure drop in the water main, a vacume could be created in the water supply system. Under certain conditions this creates a siphoning effect and draws liquid from a contaminated source back into the drinking water supply. Properly installed and maintained backflow prevention devices or valves are critical elements of safe drinking water systems in our communities and workplaces.